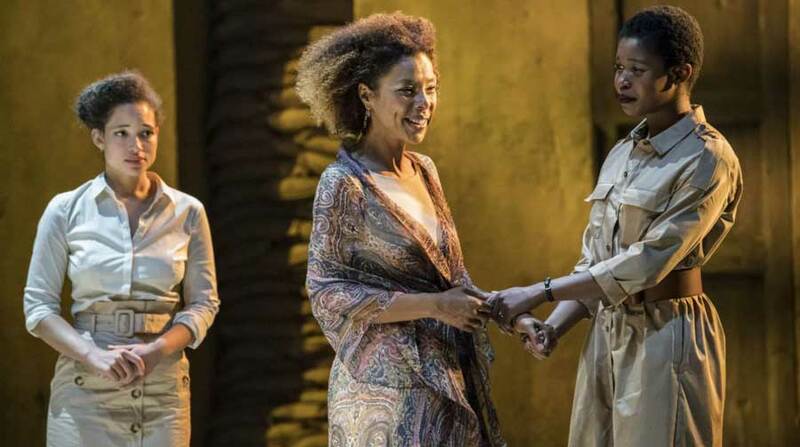 Mark Reed reviews Ralph Fiennes and Sophie Okonedo in William Shakespeare’s Antony and Cleopatra now playing at the National Theatre. Before the opening lines were spoken, I could sense an excited hush descend over the audience. 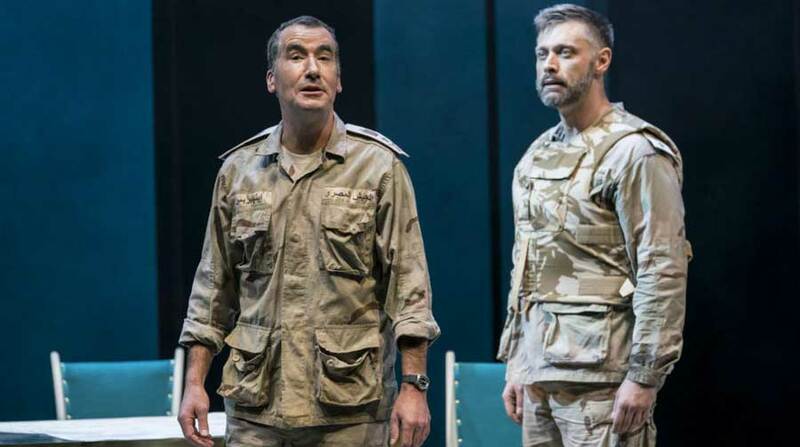 We were all on the edge of our seats, waiting to witness two titans of the acting world tackle the title roles in Antony and Cleopatra – arguably Shakespeare’s most fascinating pair of lovers. They did not disappoint. As soon as Sophie Okonedo is on stage, you don’t want her to leave for a second. Her Cleopatra is absolute perfection. She is playful, joyous, jealous and hugely entertaining – keeping her two poor handmaids incredibly busy throughout. Okonedo mines all the humour in Cleopatra’s lines, and the early scenes where she awaits Antony’s return are some of the most entertaining. The audience were in fits of laughter when she berates poor Eros (both physically and verbally) for bringing news of Antony’s marriage to Octavia. Okonedo finds great pathos too, and seeing the great Queen’s world fall apart is a harrowing experience. Ralph Fiennes gives us a beautifully layered and soulful Antony. Unlike other tragic figures in Shakespeare’s canon, everything Antony does is driven by his adoration of Cleopatra. Fiennes takes us on a vivid journey from a man drunk on love to one desperate not to lose everything he holds dear. Before the final battle, he beckons his servants to sit down on the ground with him – they weep to see their master brought so low. 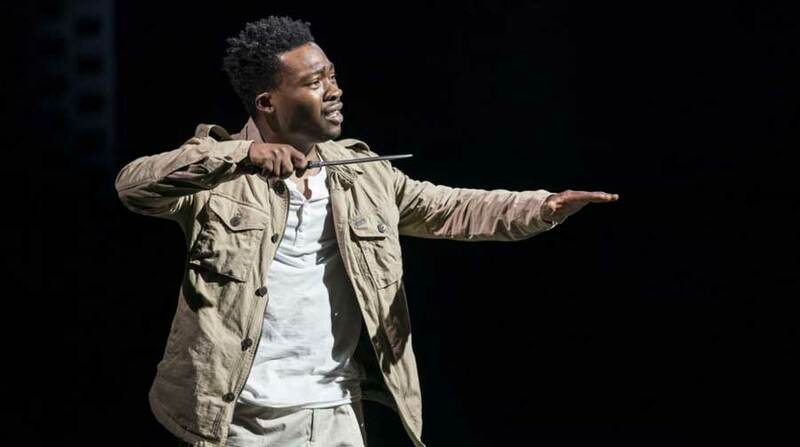 There are elements of Lear in his performance as he sways around the stage in the play’s final moments – confused, battered and a shadow of his former self without his beloved Queen by his side. 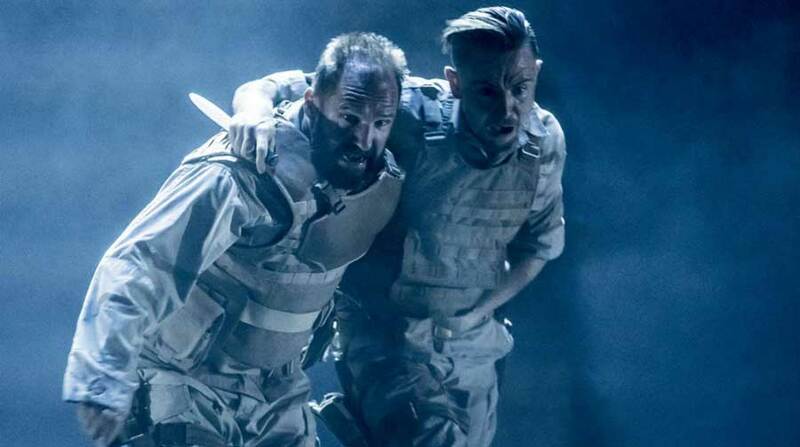 The moments where Fiennes and Okonedo are on stage together are the most memorable in the production. Their relationship oscillates between extremes as Okonedo and Fiennes tease, flirt, fight and lust after each other. They take us from opulence and delusion to intimacy and heartbreak – and everything in between. There is much to admire elsewhere in Simon Godwin’s magnificent production. He’s updated the action to a modern setting, yet the music and staging hint at something more classic. Rather than detract from the production, this adds to the drama – elevating it from a modern conflict to something more timeless. The wide, spacious set is circular and revolves – transporting us from the lush excess of Egypt, to the war rooms of Italy, to the battleground and smoke and gun fire. Music is used effectively to heighten the tension in the set changes and battle scenes. It swells at pivotal moments, adding to the sense of a huge tragedy which is gradually unfolding before our eyes. The ensemble cast is a talented bunch. 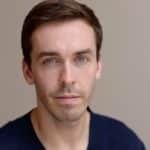 Tim McMullan brings a wry humour and charm to the role of Enobarbus and his self-disgust at betraying Antony at the play’s denouement is stirring. Georgia Landers and Gloria Obianyo give strong performances as Cleopatra’s loving handmaids. They are incredibly tender towards her, and the moments they share towards the end of the play are very touching. You forget at times that this play is not only a love story, but a political one too. Unfortunately, the early scenes between the three leaders of the Roman empire are less charged. While we know that Pompey and the looming war is a crucial moment in history, the stakes don’t seem high enough. I was always waiting to return to the lavish decadence of Egypt, and it is only when the fallout between Octavius and Antony takes place aboard Pompey’s boat that the tension starts to escalate. The production runs at three hours and thirty minutes, and you certainly feel it towards the end. While this is a brilliant show, it could do with some judicious pruning – taking fifteen minutes or so from the second half would make a real difference. I was surprised to read in the programme notes that there is not one scene between Antony and Cleopatra that takes place in private. With Cleopatra’s manipulations and Antony’s outbursts, you might think their love was mere infatuation – a drama played out for their servants and followers. Other characters even hint at it. But theirs is an inimitable love, one that is lived in front of the eyes of the world and no less real for its histrionics. Antony and Cleopatra will be broadcast to cinemas by National Theatre Live on Thursday 6 December. Mark Reed is an actor and writer who recently penned his first play, Awkward Balloon, which premiered at the Old Red Lion Theatre in July 2018. He studied acting at Drama Studio London and has worked in theatre, film and radio. Mark is an avid theatre goer and is particularly passionate about new writing and Shakespeare. He also works in communications for a national charity, looking after their social media, press and key publications.